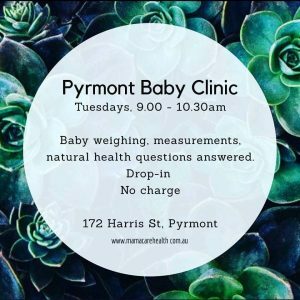 Every Tuesday morning, Kathleen (MamaCare’s founder / naturopath / acupuncturist) runs a free drop-in clinic at her Pyrmont practice for all new parents, babies and children. MamaCare’s Baby Clinic runs from 9.00 – 10.30am on a first-come, first-served basis and depending on how busy it is, you’ll have 10-15 mins to weigh and measure your baby + ask any niggling health questions you’d like answered. This is a free service and open to all local families, whether or not you are an existing patient of MamaCare, Kathleen or the clinic itself. We offer herbal tea in the waiting room, which is a breastfeeding-friendly space that also has toys and colouring in to keep older children entertained. Many women come in for a chat as much about themselves (how they’re feeling and ways to improve their own wellbeing) as they do about the baby. Sometimes partners, carers and grandparents come in too. All welcome, the more the merrier! We feel this is an important part of the process of building community-based care and creating that ‘village’ we all need, in one way or another, to help us raise children and families.